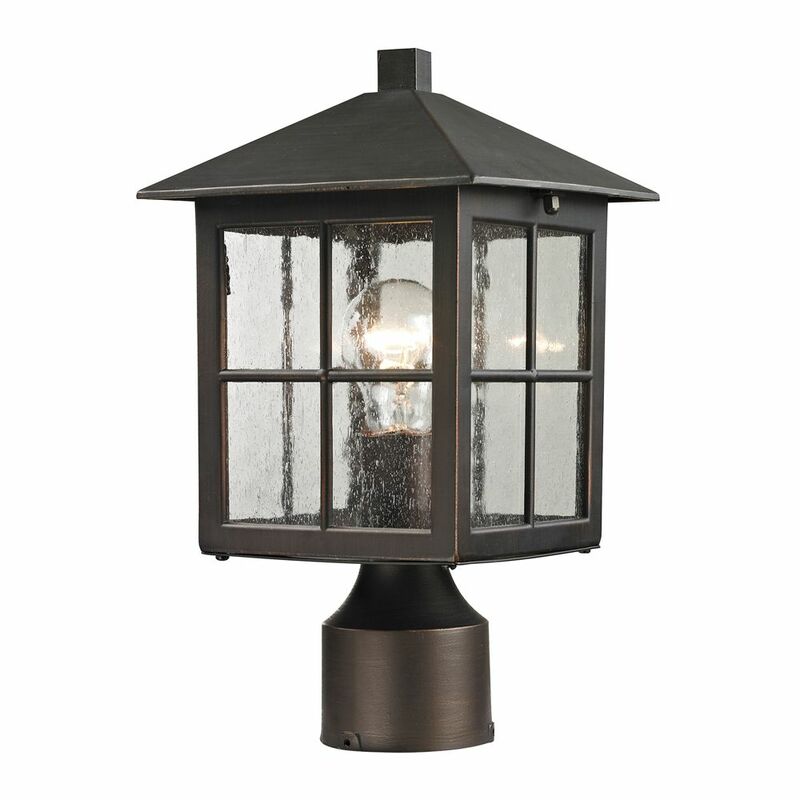 This beautiful outdoor post light is a wonderful addition to the exterior of any home. Features a hazelnut bronze finish and seeded glass. The Gama Sonic Baytown Solar Black Outdoor Post Lamp is the perfect energy-saving and money-saving replacement for outdated electric or gas-powered outdoor lighting. Standing 83-inch tall from finial to base, the rust-resistant cast-aluminum lamp post with a powder-coated black finish requires no electrical wiring for installation. The included EZ Anchor allows for tool-free setup in just minutes with no digging or cement required. Just place the post in the ground wherever you want it, and the sun will do the rest. Designed for dusk-to-dawn performance, the lamp's internal lithium-ion battery pack charges when sunlight hits any of the four integrated solar panels, so at dusk, the six bright white LEDs turn on automatically and shine through the real glass panes at 80 lumens on a full solar charge. Built for years of hassle-free operation, the lamp's monocrystalline silicon solar panels are protected by durable tempered glass that helps ensure long-lasting reliability. The Flora post mount solar lamp is a great addition to your landscape setting. It features dusk to dawn operation and a decorative ivy wrap to accentuate the light. The lithium ion battery adds extended battery life to the light which allows for less changing. Its antique bronze finish is a beautiful way to enhance your landscape. The Flora wall mount solar lamp is a great addition to your landscape setting. It features dusk to dawn operation and a decorative ivy wrap to accentuate the light. The lithium ion battery adds extended battery life to the light which allows for less changing. Its antique bronze finish is a beautiful way to enhance your landscape. Outdoor Post Lamp In Hazelnut Bronze This beautiful outdoor post light is a wonderful addition to the exterior of any home. Features a hazelnut bronze finish and seeded glass. Outdoor Post Lamp In Hazelnut Bronze is rated 4.0 out of 5 by 1. Rated 4 out of 5 by doitmyself from Looks good. Quality Good. Well made and should last a long time. Install was straightforward. It's supposed to take a lamp of up to 100w so it has a gap for venting where the top attaches. I'll only be using a 14W CF so I weather stripped the gap to keep the bugs out. I have 4&quot; square fence posts. Will this lamp fit my fence post? The bottom of the fixture has a 3&quot; round opening.